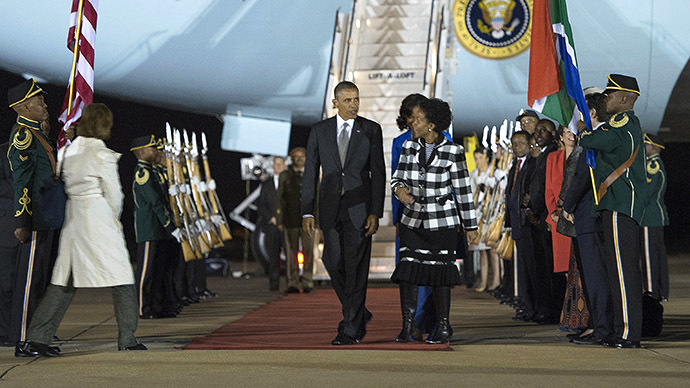 President Obama’s trip to Africa is little more than a public relations stunt to a continent desperate for his help, Lawrence K. Freeman, editor of Executive Intelligence Review magazine, told RT. RT:What can we expect from Obama’s three-nation tour, do you think? Lawrence Freeman: There’s not going to be much accomplished. The purpose of the trip is not to help the African people to develop these African nations. This is a very calculated, glorified public relations tour to three countries and most people in Africa are going to realize, and do realize already, that this country is doing nothing to help their continent. And what they do know is that the overthrow of Colonel Gaddafi, led by Obama and NATO, has been a catastrophe for north and West Africa in supporting various elements that have now allowed the destabilization of many of these countries, especially with the arms and the flow of Tuaregs and terrorists coming out of Libya. So the South African people are not pleased or happy with President Obama and he’s going to offer absolutely nothing except maybe entice private sector companies to make a few investments. But this is really pathetic in terms of what Africa needs. RT:To what extent is this more about China’s influence there? LF: Well there is this silly notion in the US that somehow China is our competitor in Africa. But in fact what China has done over the last recent period, five to ten years, is invest massively and construct all types of infrastructure projects throughout many African countries totaling tens of billions of dollars per year. So the US had to stop doing that 40 years ago. The US does not build infrastructure. The US does not provide government-backed investment in the kinds of projects that are necessary for the people of Africa. We’ve done nothing, for example, to develop water management in the African Sahel. We’ve done nothing to develop the Arab culture capability of these regions and therefore you have the spread of terrorism, the spread of insurgency because you have these alienated youth who see no future because their economies are dying. In fact Obama’s done less than George Bush and less than Bill Clinton even though he’s called the Son of Africa. So he has a record of failure and in fact he’s been supporting destabilization, such as the overthrow of Gaddafi, which has actually worsened conditions throughout Africa. RT:In terms of visits, he had one brief visit to Ghana in 2009 and now this short visit. Why only that, why not more? LF: He’s not really concerned. In 2009 he spent less than 24 hours and made one speech in Ghana. Here he’s visiting three countries - Senegal, South Africa, and Tanzania - and avoiding going to other countries such as Nigeria, such as Mali, many other countries that are in the spotlight right now. He doesn’t have anything to offer them, the United States - the transatlantic community of Europe and the United States, the financial system, is collapsing. We see this throughout Europe and the United States, dying economically, politically, and culturally. We have no vision, we have no future. Obama cares nothing about the welfare of the South African people as he cares nothing about the welfare of the people of the United States. In fact he’s supporting a British policy of genocide throughout Africa by allowing destabilization and by allowing hunger and shortages of food and medicine to kill Africans in large numbers, and this is something that could be corrected and changed if we had a policy to do that.